I am Fulgence Niyonkuru, living in Ghana. I came to know about Peace Revolution in 2012 but I got involved with Peace Revolution in 2013 and I have been active peace rebel, Peace agent, peace coach ever since. I have heard lots experiences to share regarding the journey of my inner peace building through the practice of meditation. 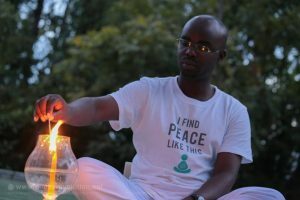 I started meditation in 2006, taught by catholic priests and the form of meditation we learned were a form of contemplation of the scriptures and it was geared towards integrating religious life encountered in the bible into our life. It was a form of imaging being at the spot of the scriptural scenes to live those moments as vivid as possible to comprehend the true meaning of it in our daily life and in our inner quietude, we sought to listen to the inner voice telling us in which way this could be applied in our lives and what can be our response to live the scriptures in our lives. It was cool and it was helpful to remain focus and understand better than those who could just hear it and don’t live it internally. When I came across meditation as applied by Peace Revolution in the Damakayya style, nothing was so new to me just concepts and approaches and it not take me time to adjust. Though I was practicing meditation, it was not guided and there was not techniques well explained and some observance attached to it: the benefits were more or less like prayer in a form of contemplation and not as mind taming practices as I am doing today. Those times, it was not as effective as it is now for me. I was still that person people knew hot-tempered, angry instantly, with unstable emotions and I could be stressed up because no real methods, approaches, and techniques were guiding me. I was that person always upset, always up and down doing things and leave them unfinished. I was that person always thinking and just thinking at times, to no avail. It affected my academics because my life story was marked by significant turbulence and I needed to work on to let me life be stable emotionally. My family experience was a bit horrible due to security issues (war) that affected me much. My life was like a mixture of fears, ambitions, and a whole lot. ..all of which made me have a high blood pressure at my early age. It affected my health and my physician always asked me to reduce stress and I always wondered how I could. I did not know what to do and my heart was affected and I had to be on medication all along. My studies was full of ups and downs and I could not fully remain still as my mind wondered all the times and my nights were so charged by terrific dreams and nightmares. I could not sleep during the day and I had to buy sleeping tablets most times. My relationship with my friends was tensed and I wanted my own world and I was told most times that I was not organized and I was always busy, but actually for nothing. 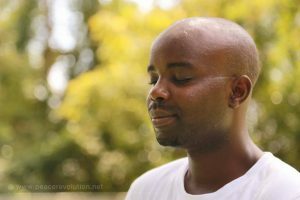 I started practicing meditation online as a peace rebel in 2013 and I discovered methods that helped me first, temporize my mind, remain calm physically and mentally. I did so well that in one year I changed so much that my friends started asking me what had happened to me. I know had a good relationship with God because I came to know what are those stuff which in live matter a lot and those that don’t at all. I came to realize that, my blood pressure has been normalized and I never visited my physician since 2014 till today and I started sleeping in the day and my nights were longer and more enjoyable. I could remain focus and I was able to finish my novels I started some years back. I was able to adopt a new lifestyle with much discipline and a kind of orderliness was part of me. I loved gardening, I started writing a lot and I achieved a lot academically. My life style changed and I became so cool that I was scared I was being too down. Too passive in everything and I was approached by being inactive in some ways because there could be times I reserve my intervention in some situations people think all the time one has to react. I preached meditation by my lifestyle and when I organized a Mini-PIPO I discovered it was not the end because I saw there was very much I still needed to learn. I did myself development program more than twice and I still needed more. Fulgence of 2012 was no more the same man in 2014 and 2015 and beyond. I had a number of young people entrusting me their life stories and wanted to hear from me, I became a counselor of my friends and I now got a nicer relationship with my friends. Not there yet, my participation in the fellowship added value to my meditation experience and when I started coaching, that was the time, I came to know more about mediation, its challenges and its beauty. I organized workshops for my friends and it is quite successful. I would have been sorry on my day of death if I had not been introduced to meditation as I would have lived a scattered life. Taming the mind, being one of the most complicated exercises, it remains for me, one of the big works, an assignment I have to do every single day, one hour out of the 24 hours of a day. I made upon myself never to miss meditation unless in times of sickness and due to other relevant duties. Having coached for 6 months, nothing is so beautiful that doing that and I hope I can carry on until the day is no more possible.